A few important things to know about the world’s most popular exchange-traded fund. Why stress over picking individual stock-market winners -- and avoiding the losers -- when you can buy the whole market in a single transaction? Purchase an index fund that tracks the S&P 500, and you gain exposure to essentially all U.S. large-cap stocks. You'll also likely outperform most professional money managers, who often can't match the annual returns of their benchmark indices. In a nutshell, that's the allure of exchange-traded funds that replicate the performance of the entire market. And there's no more popular ETF than than the SPDR S&P 500 (NYSEMKT:SPY). So let's take a look at what investors are getting when they buy into this fund. Launched in 1993, the SPDR S&P 500 -- "SPDR" is short for Standard & Poor's Depository Receipt -- is the oldest ETF around. It's also the world's biggest, with $177 billion of assets under management. And SPY is by far the most liquid exchange-traded fund: Investors swap more than 100 million shares of it every day. That's no surprise considering that the index it aims to track, the S&P 500, has nearly $8 trillion of assets benchmarked to it. SPY shareholders get capital returns that closely correspond to those of the broader market, in addition to a dividend yield that's currently 2%. Broad market coverage -- SPY is a true representation of the S&P 500 index, meaning that it owns, in direct proportion to their market capitalization, all 500 stocks that comprise the index. SPY thus covers all of the major sectors of the U.S. economy, including information technology, consumer products, energy, and utilities. 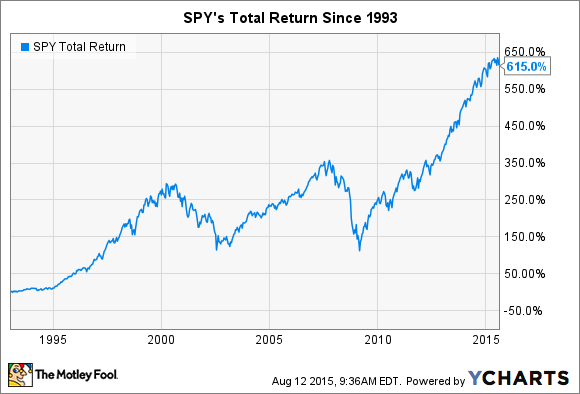 Low fees -- Because it's an index, rather than a managed fund, SPY has a very low expense ratio. Investors pay just 0.1% in fees to own this ETF compared to rates as high as 1% to 3% for professionally managed funds. Also check out Vanguard's competing S&P 500 tracker, which sports an even lower expense ratio. Low turnover -- SPY turns over only around 3% of its portfolio annually, corresponding to an average holding period of more than 20 years. That continuity helps keep fractional costs, like transaction fees, to a minimum. It also neutralizes the biggest threat to investors' returns, overactive trading. Volatility -- Even as a package of 500 large-cap stocks, SPY frequently logs double-digit gains -- and losses. In fact, SPY suffered a 22% plunge in the fourth quarter of 2008. Meanwhile, the best quarter in the last 10 years was Q2 of 2009, with its 16% gain. The SPY's annual returns. Source: annual prospectus (link opens PDF). Trading temptations -- That fact that you can jump in and out them at any moment of the trading day is usually seen as an advantage to owning ETFs. But, in light of the volatility discussed above, this liquidity raises the risk that an investor will cash out of his holdings during a market swoon. If you're quick to sell during periods of high stress, like 2008, then you might want to anchor your portfolio with an index mutual fund, rather than an ETF. Pockets of concentration -- Here's a special risk for all the Apple shareholders out there: The iPhone maker is currently SPY's top single holding, weighing in at almost 4% of the entire portfolio. Microsoft, ExxonMobile, Johnson & Johnson, and Wells Fargo round out the top five. If you own a large position in any of these stocks, it's important to realize that your exposure also extends to SPY, and any other fund that's benchmarked to the S&P 500. That's also true for market sectors: SPY is weighted toward information technology, financials, and healthcare, with only tiny bets on telecom and utility stocks. Keep that in mind when you're judging how diversified your holdings actually are.